The AMD Radeon™ R9 Fury Series graphics cards (Fury X, R9 Fury and the R9 Nano graphics cards) are the world’s first GPU family featured with the pioneering High-Bandwidth Memory (HBM). HBM achieves much higher bandwidth with much less power than GDDR5. Its revolutionary 4096-bit memory interface offers the highest GPU memory bandwidth with 512GB/sec. Below, we consider an AMD R9 Fiji Nano and NVIDIA Maxwell Titan X GPU. Fiji Nano 4096 cores organized in 64 compute units (CU), and is equipped with 512 GB/s HBM memory, while Titan X has 3072 cores organized in 24 streaming multiprocessors (SMX, like CU on AMD card) and is equipped with 336.5GB/s GDDR5 memory . The ratio of HBM to GDDR5 is 1.52x. 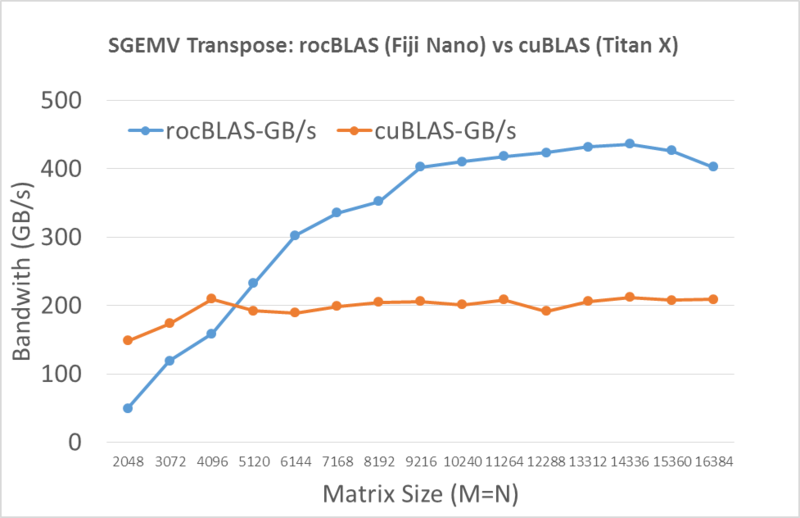 The benchmark applications used ROCm v1.2 stack for the Fiji hardware, and Cuda v7.5 stack for the Titan X.
Matrix-Vector Multiplication (GEMV) is a well-known memory bound Basic Linear Algebra Subprograms (BLAS) Level-2 routine. Supposing a matrix size of N by N, and N is sufficient large, the amount of data access is of order N^2, and the floating point intensity is order 2*(N^2). Thus, GEMV’s flops-per-element (defined as computing intensity) is only 2. It is clear that GEMV is highly bounded by memory bandwidth rather than the calculation capability. Thus, GEMV is an excellent application to test achievable effective bandwidth on a type of memory. From the bandwidth results in Figure 1, we see rocBLAS running on the ROCm stack exceeding cuBLAS running on CUDA for sizes greater than 5000. Fiji nano needs a larger matrix to saturate the GPU, because Fiji has 64 CUs while Maxwell Titan X has 24 equivalent CUs. The rocBLAS increases linearly and finally stabilizes between 400-440 GB/s. This is equivalent to 78% to 85% of Fiji Nano’s HBM bandwidth. cuBLAS does not scale, and stabilizes around 200 GB/s, which is only 60% of Titan X’s GDDR5 bandwidth. 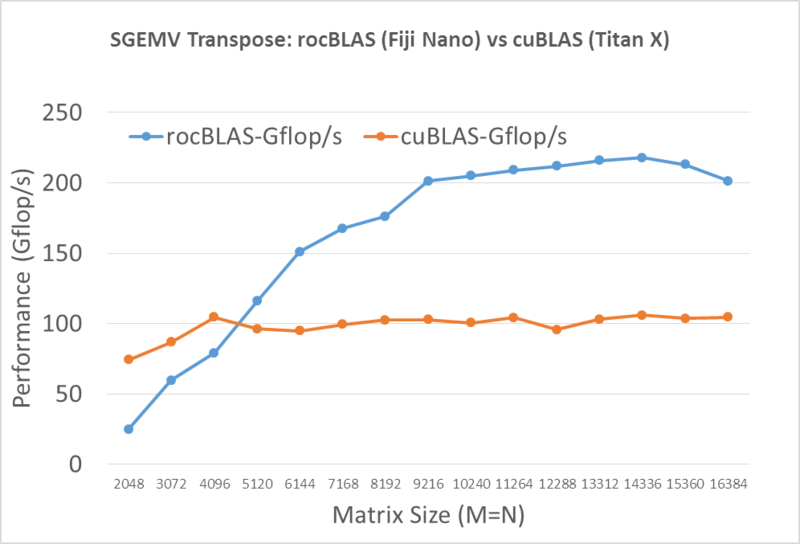 As demonstrated in Figure 2, rocBLAS achieves 200-220 Gflop/s on Fiji Nano, more than 2x faster than cuBLAS on Titan X after both stabilize. Tingxing Dong is a Senior Software Engineer at AMD. Links to third party sites, and references to third party trademarks, are provided for convenience and illustrative purposes only. Unless explicitly stated, AMD is not responsible for the contents of such links, and no third party endorsement of AMD or any of its products is implied. Would you provide a link to the source code please? This is very impressive, when will this be available on windows? rocBLAS needs ROCM environment. Currently ROCM can only run on Linux. When ROCM is able to support windows, rocBLAS will support windows automatically. Thanks for your answer, yes, I know that, but I am wondering, when will ROCM support windows ? Thanks, I am a little bit disappointed now. Lol, In Q4 already? I was hoping Linux could keep their exclusive advantage over Windows longer than that since it isn’t that often we get such a situation. No, we probably add Windows support in 2017 Q4. I don’t think you should give a date when it wasn’t confirmed. As of replying, it’s 2019-02-11. How can make up so much data point? Of course, It was verified when publishing the blog. If you do not trust, you can buy a Fiji card and publish your results. As of relpying, it is 2019-04-08.